Kim Ji-suk from "Unkind Women" has become a star announcer. 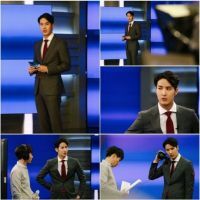 The actor takes on the role of Lee Doo-jin, who was a former star announcer with his good looks, confidence and perfect spec. The star announcer has quality and aura unlike the typical Kim Ji-suk image we have seen so far. Kim Ji-suk is looking very announcer-like, sporting a neat hairstyle with a grey suit. He's holding the cue sheet but his face is crinkled into a frown as if he is stuck in a tough spot. The announcer scene was taken on the 1st at the KBS Hall in Seoul. Prior to the making, Kim Ji-suk practiced his lines with various tones and suggested they filmed the scene at different angles for more perfection. Kim Ji-suk is playing an announcer for the first time since his debut. He's been praciting his pronunciation and intonation whenever he can to get the right tone. He even took Chinese medicine for his voice tone. Kim Ji-suk said, "I am happy to be able to work with respectable people and I worry that I might make a mistake, but I am doing my best". IOK Media claims, "Kim Ji-suk is very affectionate towards his work and he's doing more than anyone can ask for". Meanwhile, "Unkind Women" is the story of three generations of women learning the meaning of life through hatred and love starring Kim Hye-ja, Chae Si-ra, Jang Mi-hee, Do Ji-won, Lee Ha-na, Lee Soon-jae, Son Chang-min, Park Hyuk-kwon, Kim Ji-suk Song Jae-rim and others. ""Unkind Women" Kim Ji-suk's first announcer attempt"